The number one question that I hear over and over, is to explain what is considered a good/bad pressure test reading. To begin with, using a penetrometer is a useful tool to determine how hard or how ripe the fruit is that you are inspecting. Industry uses penetrometers on a daily basis when storing or packing apples, pears, stone fruit, avocados, mangos, etc. The USDA will certify their readings from pressure testers when requested, but unfortunately there are very few written policies to follow. The USDA inspection instructions for apples does devote a small section addressing pressure test procedures and instructions. But what do the numbers mean. If I follow the USDA procedures, if an apples records 6 pounds of pressure, is that good? What if I record a reading of 4.5 pounds of pressure, can I reject the load. Take a look above at the chart taken from the USDA Inspection Instructions. For example, if you are inspecting Golden Delicious apples and you have a pressure test reading of 7 pounds, the chart indicates that all readings up to 8 pounds, the apple would be considered as being ripe. If you have a reading of 12 pounds, that would equate to a firm apple. So, to answer our earlier question, what if you recorded an average pressure test reading of 5 pounds of pressure for a Golden Delicious apple…..can you reject the load? The answer is “maybe.” Remember, the penetrometer is a tool you can use to verify your findings. While inspecting the apples you suspected they were soft, when cutting there was no crisp snap, and they taseted mealy, you could use a pressure tester to backup your decision to reject the load of apples as being soft or overripe. But what if you are receiving varieties other than Yellow Newtowns or Winesaps? The USDA instructs their inspectors to base the apple variety they are inspecting on a comparable variety from the chart. Another common question I hear, “What tip should I use when pressure testing?” There are some new models of digital penetrometers on the market, but many people still use the Wagner penetrometer shown below. 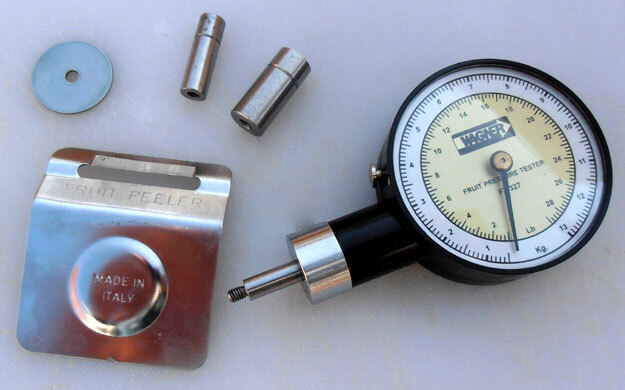 A typical pressure tester will include the slicer along with two tips. The ones shown from my kit contain a 5/16″ tip and a 7/16″ tip. It is imperative to use the correct tip for the fruit or vegetable you are inspecting. A few years ago a USDA inspector used the incorrect tip while recording pressure test readings on a load of pears. The mistake resulted in the load of pears being rejected and costing the shipper thousands of dollars. When the mistake was discovered it was too late. The USDA was forced to reimburse the shipper for the loss incurred. Click here to view a chart developed by Wagner illustrating approximate firmness levels, and the proper tip to use. Remember, the readings are only guidelines. They are very helpful, but remember to not reject a load based upon these guidelines, but they are beneficial to help you in your decision to reject a load for being overripe. Great information! Thank you for spelling out the usage of pressure test results, and the links for these charts are also very useful. I have not seen any research specifically looking at this topic. For the penetrometer itself, there should be no effect on its ability to measure force at different altitudes. While the penetrometer is often called a pressure tester, and the measurement units can be calculated in terms of force per unit area (like pressure), it is important to remember that the traditional Magness-Taylor style destructive firmness measurement using a penetrometer is the maximum force when the tissue fails. My intuition would be that non-destructive firmness measurements of the elastic properties of the tissue would be more likely to be affected by the change in altitude (and possible effects on turgor pressure) than the tissue failure strength type measurement of a penetrometer. However, this is only speculation. There may also be biological differences related to whether this is an apple grown and tested at high elevation or if it is an apple grown at low elevation, then shipped to high elevation and then tested. You might try contacting Dr. Roger Harker in New Zealand to see if he has any experience with this specific question. I do not believe the elevation would affect the pressure immediately, but the higher elevation would affect the ripening process. When pressure testing Kiwi Fruit, should the exterior skin be removed or left in tact? Thanks for the question Jeff, the skin should be removed. Thank you for the information. It’s very helpful. I was looking for some help in determining which one of the tips to use for apples. Does the instructions tell you what tip to use based on the fruit? Does anyone know why one tip versus the other? Thanks. Kavan, thanks for your question. When determining the pressure test for apples you should always use the 7/16″ tip. For everything else use the 5/16″ tip. There is a third, smaller tip, which some people do have that is used when testing the pressure test for avocados.